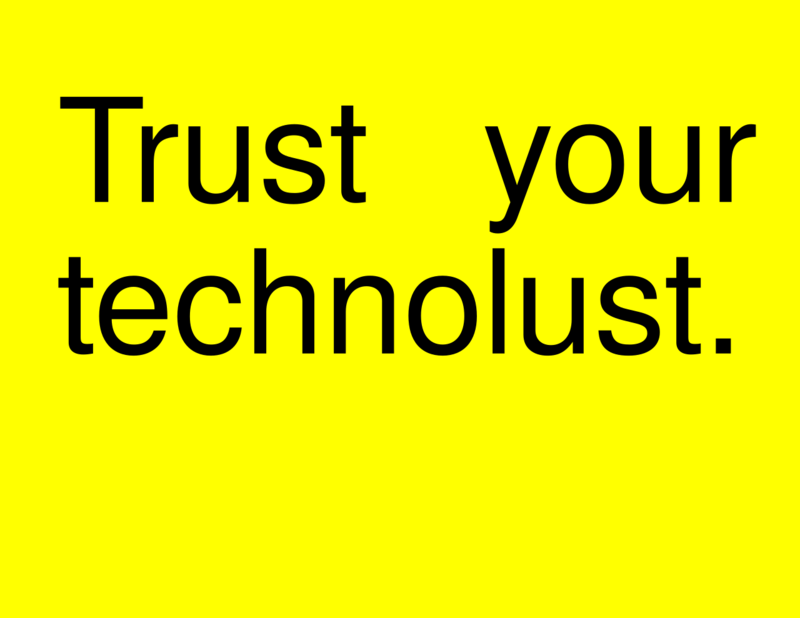 If you’ve ever lusted for a “Trust your technolust.” poster like the one seen in background of the climactic sequence in the 1995 film Hackers, you’re in luck. Just print this PDF template (also an SVG) onto a piece of yellow US letter paper. Although I’m not even the first person I know to reproduce the poster, I did spend some time making sure that I got the typeface, kerning, wordspacing, and placement on the page just right. I figured I would share. The ‘u’ in ‘your’ and final ‘t’ in ‘technolust’ are aligned perfectly in your version, but (unless I’m seeing things wrong) not so in the movie shot you reproduced above. I think there’s perspective stuff that makes it appear that way a little bit. But you’re also totally right and I’ve updated the version so that it fixes the issue. :) I also noticed that the SVG renders wrong in the browser. It looks great in Inkscape. Pingback: Trust your technolust. #Hackers « Adafruit Industries – Makers, hackers, artists, designers and engineers! Yes. Yes yes yes. Thank you for your hard work. I will find some yellow paper to get this printed well.